COOL TOOL: I stumbled across this really neat gadget the other day. It's called "Kill A Watt" made by P3. 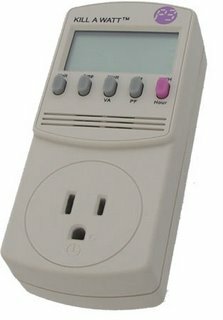 Just plug a device in and it will tell you useful information like how many watts, amps, va, and Kwatt/hrs the device is using in real time. It also give you the volts, frequency, and power factor of the input power. Useful for knowing the quality of power your receiving from the power company. I was pleasantly surprised with mine. Considering the size of this project, I figured this would be an indispensable tool to have. Well I just received it in the mail and did some preliminary testing and......oh my. IF I plug in every light strand I have so far and turn everything on at once, it's going to draw over 30 AMPs or around 3800 watts! This is going to require some careful planning and an electrician to wire in some high power outlets. Also need to make sure I don't over load any of the circuits, so if I need all the lights on at any given moment, I'll might need to raise them up to only 80-90% of max intensity. Then again, planning is half the fun for me. More lights. Need more lights!